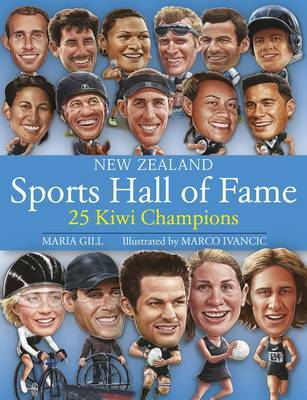 "Features 25 famous New Zealand sportspeople across a wide range of different sporting disciplines. Includes a caricature, an action photograph, a profile of the person, timeline, inspirational quote, description of the sport, training regime and trophy board"--Publisher's inform... read full description below. "Features 25 famous New Zealand sportspeople across a wide range of different sporting disciplines. Includes a caricature, an action photograph, a profile of the person, timeline, inspirational quote, description of the sport, training regime and trophy board"--Publisher's information. Maria Gill writes creative non-fiction for children and regularly visits schools and libraries around the country promoting New Zealand books. She has published eight books with New Holland including Call of the Kokako, Eruption! Discovering New Zealand Volcanoes, Running the Country, The Last of Maui's Dolphins, and New Zealand Hall of Fame. Maria has a background in Primary School teaching and now writes full-time from her lifestyle block in Matakana. Marco Ivancic is a freelance illustrator who has a broad portfolio that includes fantasy and science fiction work. He enjoyed producing the illustrations for this project as he's very keen on sport, especially football and rugby league. He works in Adobe Photoshop.